When I was little I remember my dad saying, “Blessed are the flexible, for they shall not break.” If ever that applied, it was this last Wednesday. Last Wednesday I coordinated a visit of the student council of one of the international schools here in Jakarta to come and visit the kindergarten we run in one of the trash dump communities. They were going to come and visit with each of the two kindergarten classes. During the visit they would do an activity together and have snack time. The purpose of the visit was to begin to form a partnership between the two schools. Well, I’m beginning to learn that here in Indonesia, like the rest of the world, things don’t always go exactly like you planned. The driver who was supposed to bring the international school students canceled last minute, so they had to find someone else to drive the little bus. The person they did find ended up getting incredibly lost and arrived two hours later than planned. By then the first class had already gone home and the second class was about to leave. By this point I was in salvage mode. Thankfully the second kindergarten class had not quite left yet, so we were able to get them to perform “Twinkle, Twinkle Little Star” and stay just a little longer for snack time. After that we had just enough time to take the international school students up part of the trash mountain to give them some context about how these children live. Though the visit did not turn out the way I had planned and envisioned for it to go, it was a success. The international school students (and myself) were able to see how life really works…things don’t always go as planned, but not going according to plan does not mean they don’t work. And because we rolled with the punches, so to speak, they were still able to meet and talk with the kids–which had been the whole purpose of the trip to start with. So, I guess what I’m saying is that my dad was right, blessed are the flexible, because they shall not break. “Mine is the ugly house in the back.” Those were the first words Wua told me when I sat down next to her in the under-the-bridge community I visited Saturday. Wua is eight years old and has lived in this community hear whole life. “I want to go to school,” she told me, “but mom said I have to stay and help her.” Apparently she should be in third grade, but she is not allowed to go to school because she needs to stay and help her mom earn money. Since she cannot attend the government school, she has been attending the Saturday tutoring sessions a volunteer group runs every week. I had the opportunity to visit during one of the sessions. During one of the breaks, Wua came up to me showed me her artwork–and the fact that she had written her name! 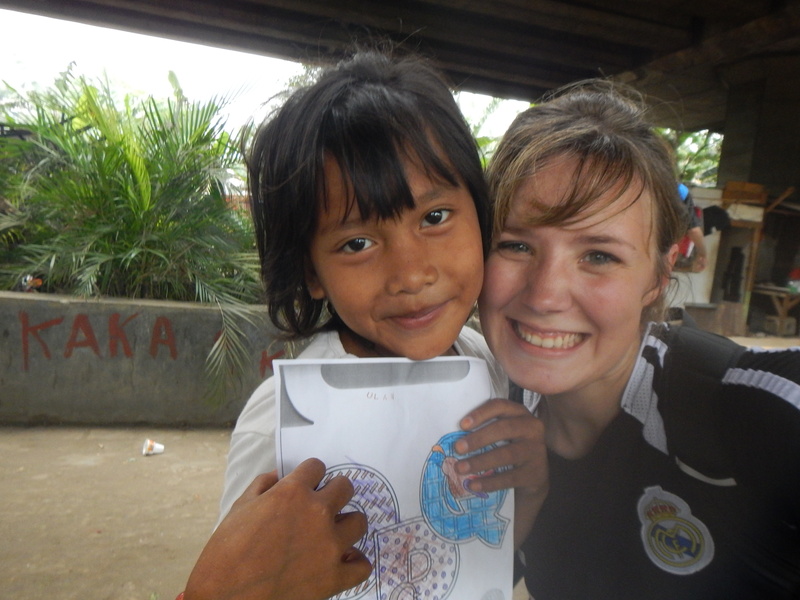 Wua’s community is the same community where the kids from the soccer outreach live. It was so eye opening to be able to see where they are from. I must say, it was not at all what I expected. Maybe it’s because I’ve only ever seen under-the-bridge communities in movies, but I was not expecting a whole organized little village. 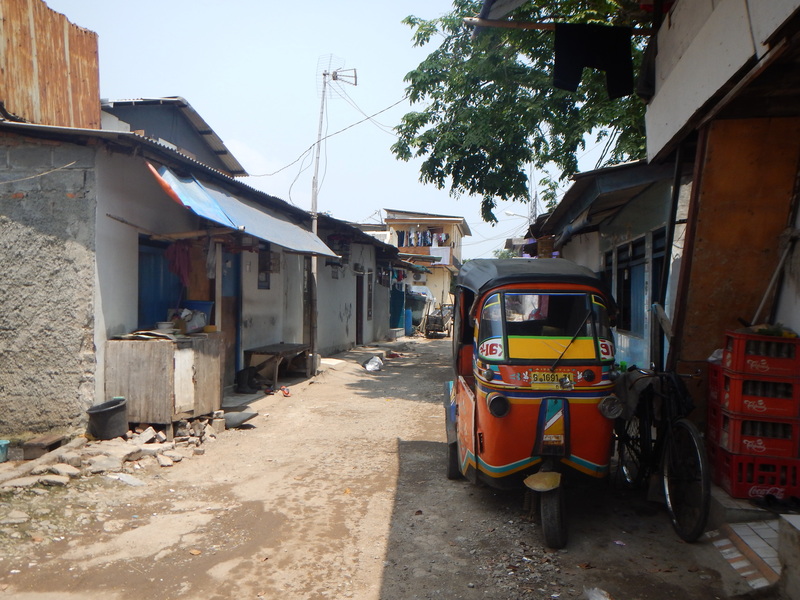 They have a store, food stalls, and their houses (well, shacks really) are organized into streets. One of the older girls from soccer took us all the way to the back of the community, past the open area where the kids have their tutoring sessions. As I sat next to Wua taking it all in, I felt very torn. On the one hand, it made me so sad that she and the other children there have to live in shacks underneath a bridge. But on the other hand I was amazed at the little society they had created for themselves. 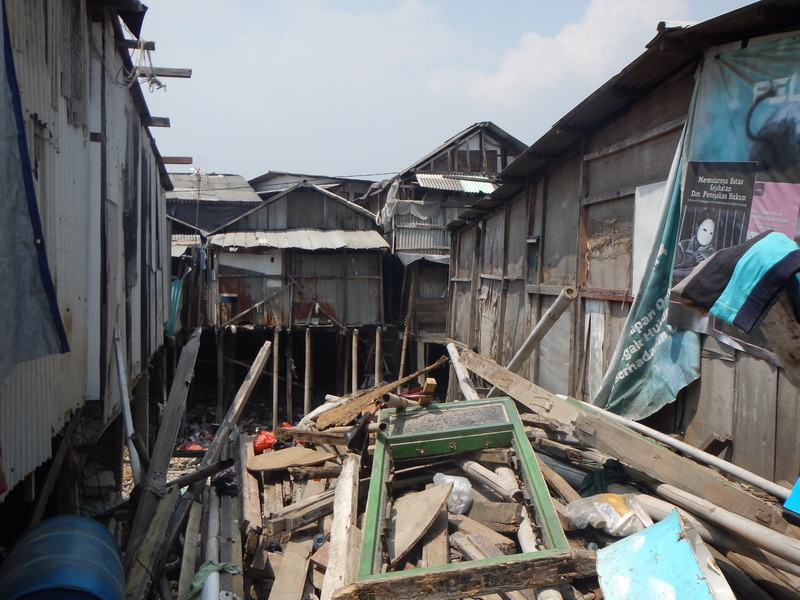 They had even taken parts of a used jungle gym and used it to build parts of their shacks. While I was walking around some of the little boys were climbing up playing on the repurposed jungle gym. I think maybe part of the reason it wasn’t a hopeless visit was because there are people there making a difference in the lives of these children every week. Volunteers from all around Jakarta, from all different paths of life, come together to teach and tutor the kids in this community. I take my hat of to them, they are an amazing and dedicated group of people. It is so exciting to know that there are people all over Jakarta doing their part in making a difference in lives of Indonesian children. Friday I went to North Jakarta to visit one of our kindergartens. After we observed class for a little bit, I grabbed Korry and we went for a walk around the neighborhood because I wanted to have a feel for what the community really looked like—beyond just our street. As I exited the kindergarten building, this vendor was passing by. 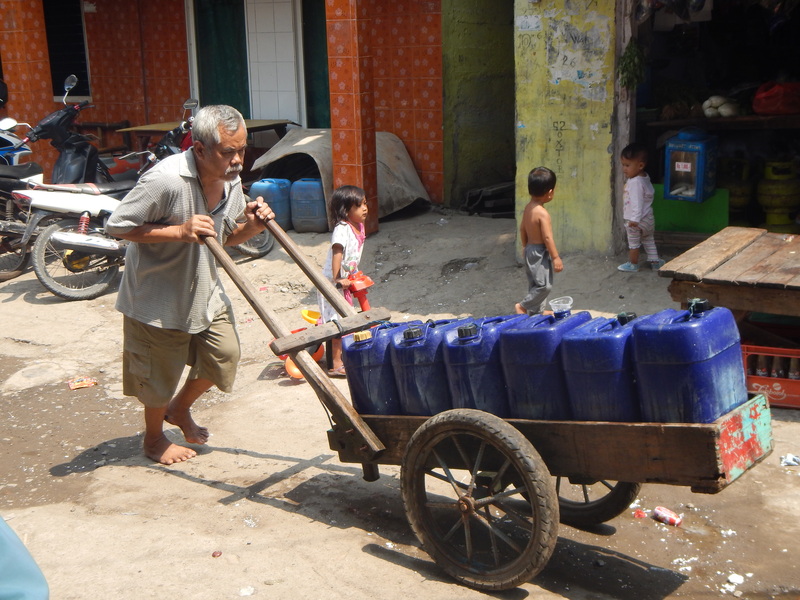 He sells “jerry cans”—buckets of water that the local residents use for bathing and cooking, or boil for their drinking water. At the end of the street is part of a containment lake. On both sides of the lake are shacks build on stilts. Technically it is illegal to live on that strip of land because it further pollutes the water in the lake. Apparently the word on the street is that the new government is going to enforce the law and force all the residents to move to public housing and then bulldoze their current community. By the containment lake I found all sorts of goats lying around—they were even chillin’ on the dam. 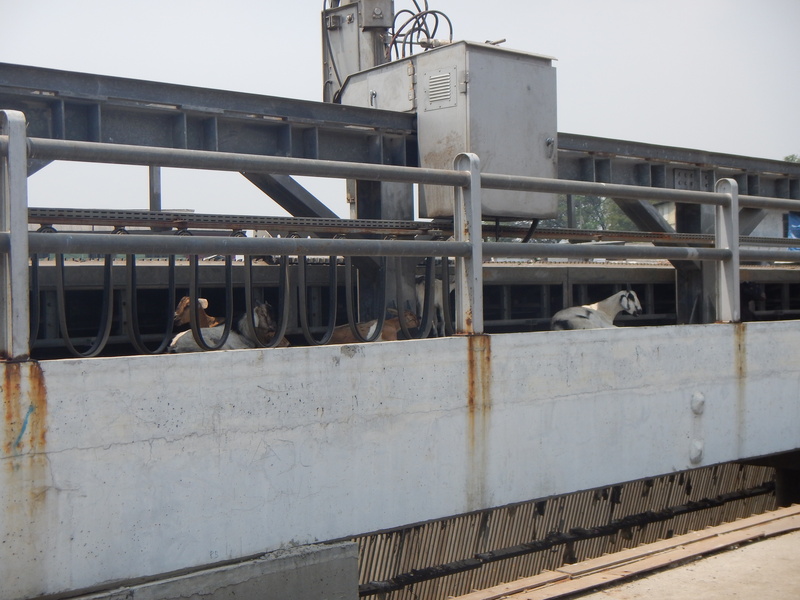 I asked Korry why there were so many goats, and she said it was because Idul Adha (Muslim feast of the sacrifice) is coming up next week and after that….well….no more goats. 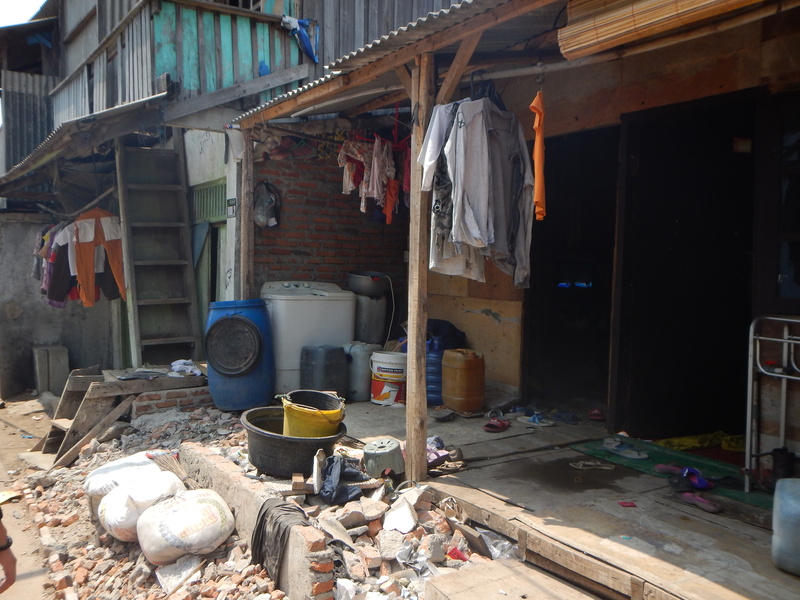 As I continued down the main street, I walked past houses that are really more like shacks. Seeing these homes made me realize that I should not ever complain about where I live. If families can make this one room shack their home, who am I to ever complain about where I live? After going down the main street for a couple of blocks, I turned again and went down a side street and happened upon a cool vehicle. The vehicle, really more of a cart on wheels, is kind of like a motorized tricycle. You don’t see this form of transportation much anymore in other parts of Jakarta—so I hadn’t really ever seen one before. Finally I ended up back at our community center where we house the kindergarten and medical clinic. As I walked up some of the moms were waiting out front to pick up their kids from class. It was fun to get to see a glimpse of their community. Next time hopefully I will be able to go into one of the homes and get to talk to families, rather than just observing. But walking around was definitely a good first step!